Pavan knows the problems and needs of builders, and does everything possible to find the right answer. 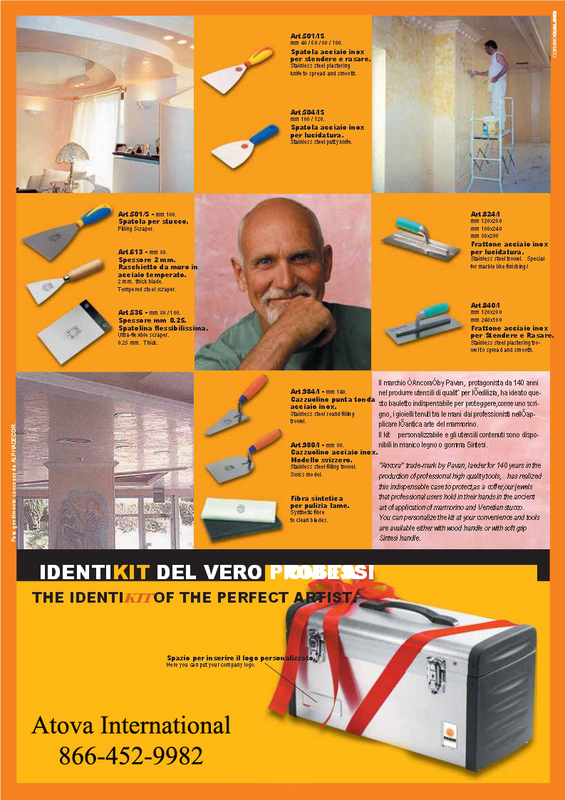 This is why the special Kit for Marmorino, Venetian stucco and lime putty was created – a professional kit to create real works of art, contained in a practical little case, which protects the artists’ tools like a precious coffer; tools which become jewels in the expert’s hands, recreating the antique art of marmorino. With this kit the craftsman can give the utmost expression to his own special distinguishing and creative style, and can choose his tools with wooden or Sintesi rubber handles. The case is divided inside in two compartments which hold a complete range of tools: spatulas for spreading and smoothing, putty knives, tempered steel scrapers, super-flexible small spatula, plastering trowels for polishing, spreading and smoothing, round tipped trowels, square tipped trowels and, to complete the offer, synthetic blade-cleaning fibre. Only an expert hand can create the splendid marmorino, stucco and polished lime finishes, but the expert must have a reliable tool to ensure the best result. Complete Tool kit for Decorative Finishes. Included 18 tools which you can do all work with one box. Aluminium light box with two dividers help you keep tolls organize and secure easy to take of or slide in. Special steel welded trowels. Top ergonomics for the widest variety of jobs. Flexibility and toughness guaranteed under all working conditions. Assembly by welding is tested rigorously for load bearing and x-rayed for perfect joining. An exclusive lip process ensure the perfect application and the quality of the final polishing operation. Pavan is sensitive to the problems and needs of building contractors and make every effort to resolve and satisfy them. For this purpose, was born on kit for the production of marble, Venetian spatula and lime. A kit for professionals to work by real artists. The whole is enclosed in a trunk designed to protect, like a precious jewel, the tools of the artist, which become jewels in the hands of professional interpreter of the ancient art of marble. A kit that puts the operator in a position to give their best. And because every artist has its own peculiarities, the kit Pavan is customizable content and tools are available with the wooden handle, and with that rubber synthesis. The trunk is internally divided by two doors which in turn can accommodate a full range of tools: spatula to spread and smooth, polished spatula, putty knife, scraper wall made of hardened steel, highly flexible spatula, trowel for polishing trowel for spread and smooth, round tip trowel, trowel square tip and, finally, the synthetic fiber to clean the blades. And that's not all. The artist likes to sign his works. So the trunk Pavan reserve a space for custom logo artist. A signature of the author. The box is made with a revolutionary technique of composite construction that provides caps embossed aluminum, cold bent thick 12/10, combined with side panels termoforati ABS "Soft Touch", an innovative material derived from the automotive industry, the matte surface and rubber, highly protective, shock-resistant and pleasant to the touch. 503 Extra-type putty knife with brass ferrule. 882/1 Sponge Trowel 215x135 mm - 8.5x5.3 in. 882/2 Sponge Trowel 240x100 mm - 9.4x3.9 in. 846/I Pavan Inox Trowel 200x800x0.5mm - 9.4x3.9x0.019 in. 817/RS1 Pavan Plastic base trowel with thin and very flexible blade, Blade thickness: 0.039 in. "Sintesi" handle.